In the spring of 2013 the Apache Alaska Corporation began production of oil at the Apache G site near Beluga, AK. Beluga is on the Cook Inlet approximately 45 miles southwest of Anchorage. This remote site is only accessible by sea-going barge or by air. Apache required a drill oil waste pit for the operation. 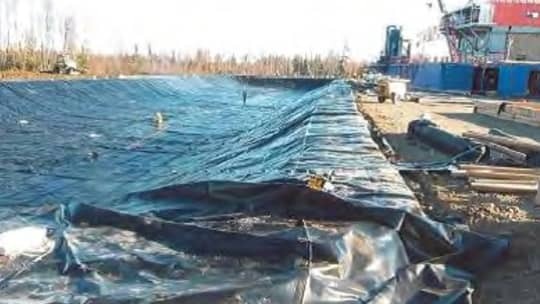 McLane Consulting, Inc., out of Soldotna, AK, was the site, civil engineering consultant to Apache. Designing the pit fell within McLane’s scope. Lining the pit in order to meet environmental requirements presented several challenges. First the liner had to be hydrocarbon resistant. Secondly, it had to be a material that could both withstand the extreme cold in Alaska and be deployable in low temperatures. Finally, the product had to be easy to transport and install in a remote location like Beluga. Faced with this difficult set of requirements, McLane reached out to ACF West, based in Portland, OR, for guidance. ACF immediately turned to XR-5 geomembranes as the solution that would work best for Apache’s site. With over 30 years of proven use in Alaska, XR-5 is a known and reliable liner for use in the region’s extreme cold. Because XR-5 is a reinforced geomembrane, it is very flexible. The flexibility allows XR-5 liners to be prefabricated into very large panels (15,000 sf in this case) and folded. The folded panels are the then palletized for convenient shipment by either sea or air. Because most of the seaming is done in the factory, the large panels require minimal field welding. This proved to be an important construction consideration for the site. Finally, XR-5 coating is formulated using the DuPont product Elvaloy. This unique formulation not only gives the liner very good resistance to cold but excellent resistance to hydrocarbons (like crude oil) as well. 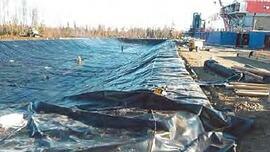 Seaman’s XR-5 30 mil Geomembrane proved to be the right product for the job. Prefabrication of panels proved to be a cost effective, easily constructed solution resulting in a finished product that Apache will be able to rely on for the life of the project.